38 unnumbered pages : color illustrations ; 28 cm. Sam and Dave decide to dig a hole, and to keep digging until they discover something spectacular. Even though they don&apos;t discover they treasure they were in search of, their dog helps them dig through the earth, and they end up in a place that looks like their back yard. Reading Counts: Level 1.9 LG / 0.5 Points / 169653. 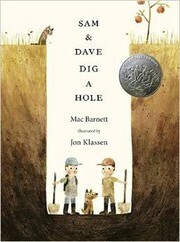 Sam & Dave dig a hole / Mac Barnett ; illustrated by Jon Klassen. Accelerated Reader LG 1.9 0.5 169653.